Several pieces from the Sutton Initiative for Design Education Chair Library at Salem College were shared with the Winston-Salem community during the opening of the latest exhibit at Reynolda House on August 21. The Art of Seating: Two Hundred Years of American Design features more than 40 iconic chairs that tell the dynamic and engaging story of the history, design, and culture of American seating. Chairs from Salem’s Library were on display during opening night, to allow guests to take pictures of them and experience them. They will return to Reynolda House on October 2 for See, Touch, Sit – an event partnering Salem College students with exhibit guests. In conjunction with the exhibit opening, Dr. Diane DeMell Jacobsen, exhibit curator, visited the Chair Library at Salem to explore our rich and varied collection. A successful business executive, International Affairs Scholar, and passionate collector of American art, Dr. Jacobsen established the Thomas H. and Diane DeMell Jacobsen PhD Foundation in 2011. The foundation is dedicated to collecting, preserving and sharing museum quality works of American art. The collection includes paintings, sculpture, silver and furniture. 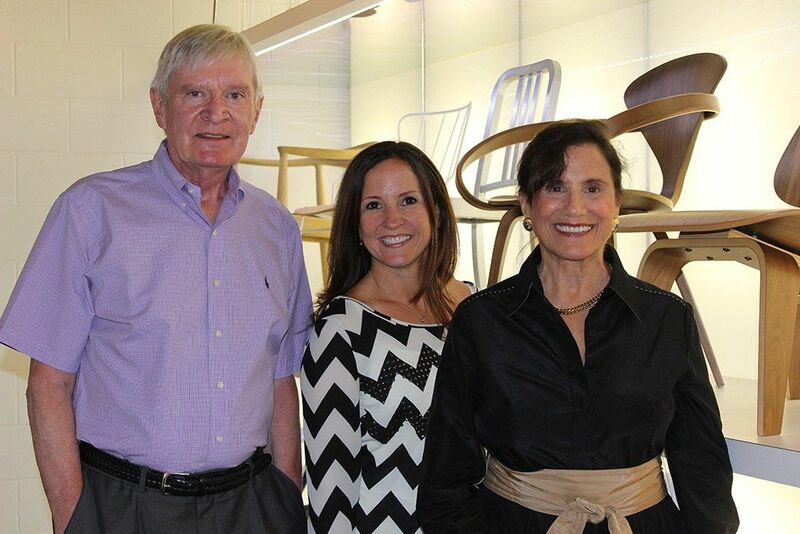 Dr. Jacobsen met with Charles Sutton, benefactor of the Chair Library, and Dr. Rosa Otero, Assistant Professor of Design and Director of the Design Program. For those interested in visiting the Reynolda House exhibit, more information can be found here on their website. If you are interested in visiting the Sutton Initiative for Design Education Chair Library at Salem College, please click here for more information on their Facebook page.